Happy Sunday, all! How has your weekend been so far? We were pretty lazy yesterday, which was nice! Except...Josh made us the yummiest dinner! It was SO good, and I have tons of leftovers for when he is gone this coming week. We caught up on a bunch of our DVR'd shows, and then watched a movie called The Bang Bang Club. It is graphic & gruesome, but a true story based on photojournalists in South Africa in the early 90's. Obviously, it is something near to my heart, and I found it quite interesting, and heartbreaking, and redeeming in a way. It is not a movie for everyone, but I am glad that I took the time to watch it. 1. Make A2 card from black cardstock. 2. Cut dotted paper slightly smaller, then adhere a woodgrain paper strip diagonally across the middle. 3. Cut off the excess, then add yellow sticker to the top left side. 4. Add washi tape strips to the top & bottom of the woodgrain strip. 5. Adhere the journal card to the front with foam adhesive, then accent with hearts & book paper. 6. Add a jeweled sticker tucked under the left side of card, then accent with a star sequin & jewels. 7. 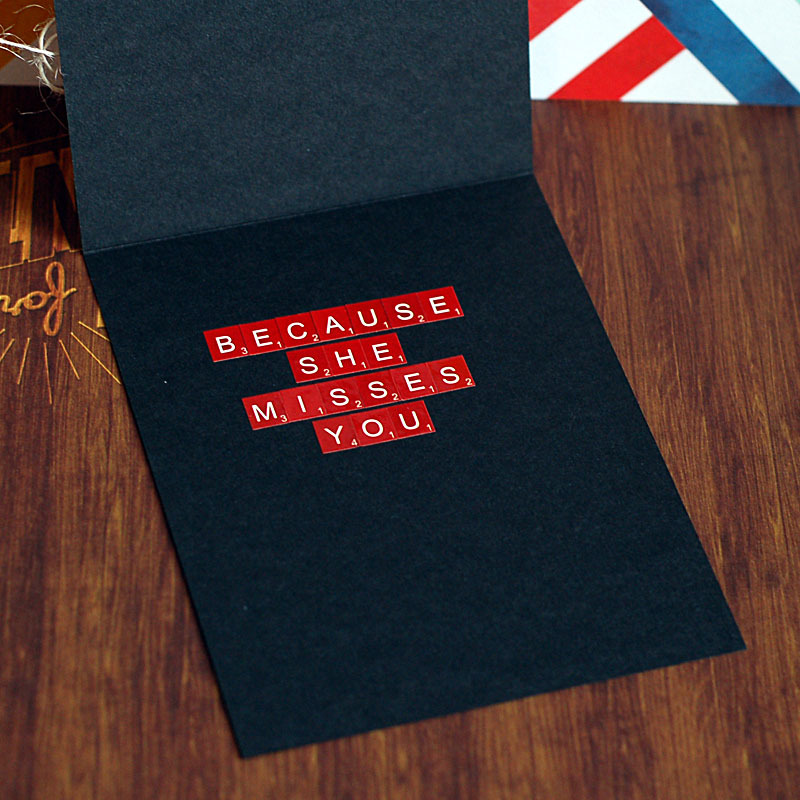 Stamp the sentiment to chalkboard paper, cut out and adhere to the bottom of the card. 8. Tie a double bow from twine, thread a button around the middle and adhere below the yellow sticker. 9. Finish the sentiment on the inside with teeny alphas. I know the other Mama Elephant designers have some amazing cards to share with you using the Say What set as well, so be sure to check them out! I hope you enjoyed my sweet missing you card this morning! Don't be afraid to customize your sentiments using all the amazing alpha stickers you might have in your stash. It will make your card extra special, and your stamps more versatile! This card ROCKS, Miss Lea!! Holy cow! This card is AWESOME, Lea! The inside sentiment is very clever. Your cards are always so stunning! great card, love the interior! Fun card! Love the way you used the sentiments and all the layers. Cute inside too!! Brilliant card love the design and DP. such a fun card. love the happy colors, too. must check out those paper! This is so delightful, Lea. A great way to send some cheer to someone you haven't seen for a while. Love all your different elements - really interesting. Thanks for playing along at Fab'n'Funky Challenges this week. Hope you'll be back again soon. Who wouldn't love to get this in the mail? The colors really pop against the dark card base. Love the mix of patterns and textures, too!